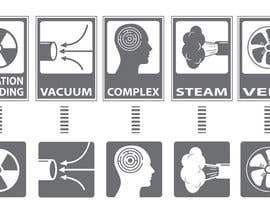 UPDATE: I uploaded more ideas: Hard Wired, Conduit Icon, Vacuum icon and Steam icon design that I would like everyone to use. None of the current designs submitted look like this - it is my own idea. For the "Vacuum", I am trying to capture the "flow" of air into the pipe. Might be better with curved arrows? For the "Conduit", it is supposed to be the routing of electrical conduit. For the "Hard Wired", it is a "Wire Nut" with 2 wires coming into it. 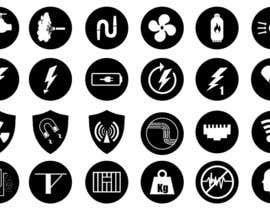 I need 24 icons that will be used to indicate the special design considerations in a hospital. 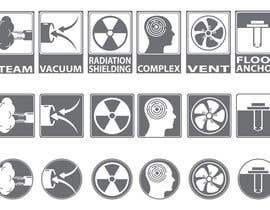 Each icon will represent a different type of condition that the engineer must be aware of. The images in the attached file are conceptually what I want - but they need to have a common design concept, so they all look uniform in size and resolution. Here is a list of all of the items and a description of what I want the icon to communicate. Water - Piped water into the room. Drain - Drain line in the room. Normal Power - Electrical power in the room. Emergency Power - Emergency Power (Generator Power) in the room. UPS Power - Battery Power back-up in the room. Conditioned Power - Conditioned Electrical Power in the room. This icon looked nice, but I have no idea whose it is or what it is supposed to represent. If you can use the "Normal Power" icon you create and then modify it slightly to represent the conditioned power requirement, that would be ideal. Maybe just a "halo" around the bolt? Dedicated Circuit - Require a dedicated electrical circuit. Hard Wired - Not simply be a plug-in, but will need to be hard-wired. Radiation Shielding - Room will need to be shielded for a radiation source inside the room. Magnetic Shielding - Room must be shielded for a strong magnetic source inside of the room. RF Shielding - Room must be shielding from Radio-Frequency sources. Cable Conduit - Room will require conduits to run cabling inside of them. Data Jack - Data outlets in the room. Wireless Data - Room will need access to a wireless signal. Floor Anchor - Equipment in the room will require floor anchorage to secure it. Ceiling Support - Equipment in the room will require a structural attachment in the ceiling. Wall Backing - Equipment in the room will require additional wall support for mounting. Heavy Item - Very heavy items will be in the room and may require additional support. Vibration Isolation - Items in the room are sensitive to vibrations. Complex - Identify the fact that the room has many design criteria and they had better think hard about it! Again - I am looking for a consistent design theme for all of the icons. These may be printed by clients on Black and White printers, so while color can be used, the color cannot be the sole differentiators between icons. I like the idea of the "Shielding" icons being shaped like shields. But for the others, you can make them universally the same shape - a circle, a square, a triangle, or make similar "families" of related items the same shape. This project lends itself to someone technically knowledgeable about construction and architecture/engineering. 24 icons in a vector format.